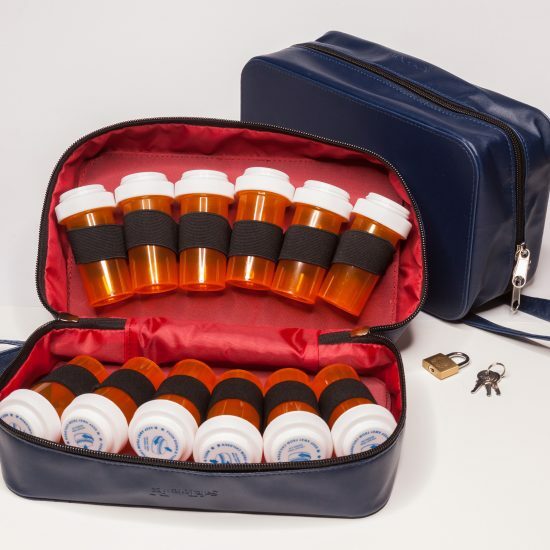 Keep your medications safe and secure! A rise in multi-generational households increases the risk of children’s access to grandparents’ medications. Working and single parents who rely on multiple caregivers may not accurately coordinate the timing of children’s dosages; many of which are designed to taste good and may entice them to take the medication when unsupervised. And, of course, kids and especially young children are curious and love to put things in their mouths. “Fantastic product! I love the way it keeps my medications organized and locked up away from my young child. It is also fantastic for travel as it keeps all our families medications in a safe and organized place! Great for getting through airport security as well.” -Stephanie U. “Thank you for helping protect our grandchildren from getting into our medicines. They can play, but not get in.” -Edna & Charles W.
“Love love love this medication storage bag! All my bottles are safely away from my children and our pet. Love the organization and travel convenience!! !” – Amy J. “My medicare patients will love this. They are constantly unorganized with their prescriptions.” -Drew B. “Easy to go through security at the airport. The TSA locks make this a must when I travel by air.” -Bill J.